In every sport, any sort of injury is a source of anxiety for the athlete, with mental and physical discomfort taking their toll. When pain hits the foot in a sport like tennis, it can be very frustrating and debilitating. One must immediately try and identify the cause of the foot pain, as it can lead to long periods on the sideline if not treated early on. Today we are looking at Haglund's Syndrome, which is very common in tennis. We will analyze it from an etiological point of view, but also look at how to treat it simply and effectively. 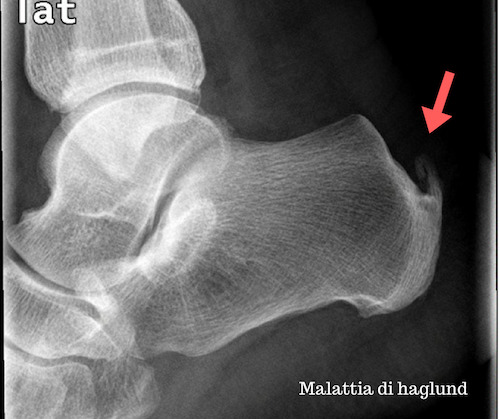 Haglund’s Syndrome is an abnormal proliferation of bone in the retromalleolar groove, the area behind the heel. In the most serious cases, the appearance of a bony projection can be seen behind the heel. The affected area is very delicate, as it is right where the Achilles tendon is located. This tendon is the largest in the human body, and responds to the contraction of the calf muscles (Soleus and Gastrocnemius). Just the continuous tension and traction of the muscle can be the basis of an inflammatory process, linked to the creation of micro-injuries. The body tries to "repair" these by adding extra calcium to the system, giving rise to calcification. Clearly, the inflammatory process starts long before the onset of the painful symptoms, and when a radiographic examination is prescribed by the doctor, an image similar to the one shown above usually reveals itself. The painful area will appear reddened, swollen, and in the most severe cases a bony protrusion will appear, just like a spur. Pain in the Retrocalcaneal area almost always occurs gradually, and symptoms are often ignored until the situation becomes relatively serious. Treatment occurs in 2 phases, for the acute condition itself and for the prevention of future pain. Usually, effective treatment will completely relieve symptoms, but in serious cases surgery may be required to remove the excess bone. Physiotherapy is always effective, and helps to resolve muscle contractions. Through meticulous palpation you can deactivate any trigger points at the calf level. The most efficient treatment for this condition is shockwave therapy, though it may not always be an available option. This therapy can directly treat the Achilles tendon and stimulate the natural healing process. Unfortunately, it can be a little painful, but the treatment is very fast and the effects will be felt immediately. The application of ice to the affected areas three times a day for 15 minutes will greatly aid in recovery. A medicated ointment, or a natural one like arnica, can be applied at least twice a day. Wrapping the ankle at night has also proved beneficial. Constant stretching is also recommended. Particularly effective is to stretch the heel as far as possible and holding that position for 30 seconds. It is also useful to perform exercises using the foam roller, both to treat the pain and to prevent future injuries. These exercises should not only focus on the heel, but on the entire leg. Finally, treatment should be rounded off by analyzing your posture and style of play to identify any contributing factors. Return to athletic activity should be delayed until all symptoms have disappeared completely and muscle balancing has been performed. Healing completely from Haglund Syndrome is possible, but it takes time and commitment from the patient.